OUTSTANDING PAIR OF TICKETS FOR THE ELVIS PRESLEY CONCERT HELD ON OCTOBER 4, 1974 IN OLYMPIA STADIUM IN DETROIT, MICHIGAN! ALSO INCLUDES THE EXTREMELY RARE DINNER TICKET! ALSO INCLUDES THE ORIGINAL TICKETS ENVELOPE! 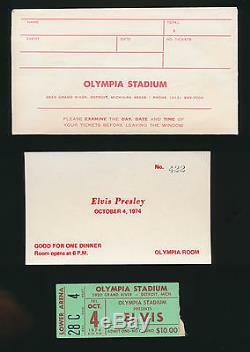 VINTAGE 1974 CONCERT TICKET STUB AND COMPLETE DINNER TICKET FOR THE ELVIS PRESLEY SHOW AT THE OLYMPIA STADIUM IN DETROIT, MICHIGAN ON OCTOBER 4, 1974. THIS IS A FANTASTIC TICKET STUB AS IT WAS THE MAJOR PORTION OF THE ENTIRE FULL TICKET. IT HAS THE COMPLETE' ELVIS' PRINT RETAINED ON IT. SIZE OF THE TICKET IS 3 1/4" X JUST UNDER 1 1/2". IT IS IN GREAT NEAR MINT- CONDITION. THE DINNER TICKET WAS FULL AND COMPLETE AND IS SIZED 3" X 5" AND IS NEAR MINT WITH SOME VERY LIGHT AGE MELLOWING. 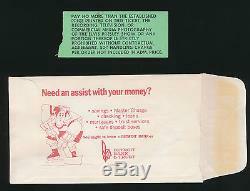 ALSO INCLUDED IS THE ORIGINAL TICKETS ENVELOPE SIZED 6" X 3 3/8". IT IS IN VG++ CONDITION. GREAT SET OF HISTORIC TICKETS TO WHAT WAS REALLY ELVIS LAST GREAT FULL TOUR. THE 1977 TOUR WAS SHORTENED DUE TO THE KING'S UNTIMELY PASSING. Will be packed securely in strong boxing to insure safe arrival. Hello to my fellow Beatles fans and collectors, and to all other music collectors! As author and co-author of eight editions of the official Beatles records and memorabilia reference/price guides since 1983, my published works on the subject of Beatles collecting have become the standard reference throughout the world. I have gained respect worldwide for my knowledge and expertise in Beatles collectibles. As well as other major artists. With me, your satisfaction is guaranteed! The item "Elvis Presley FANTASTIC CONCERT TICKET STUB AND DINNER TICKET 1974 W ENVELOPE" is in sale since Wednesday, January 27, 2016. This item is in the category "Entertainment Memorabilia\Music Memorabilia\Rock & Pop\Artists P\Presley, Elvis\Concert & Movie Memorabilia". The seller is "perrydcox" and is located in Scottsdale, Arizona.